The redheaded pine sawfly can be very destructive, attacking trees that are 1 to 12 feet tall. Infestations may be worse on trees already under stress due to a poor site or if under severe competition from other trees. This species attacks jack, shortleaf loblolly, slash, red, Scots, and other 2- and 3-needled pines. The redheaded pine sawfly has a red head with two black eye spots and six rows of black spots along a yellow-white body (Figure 1). They are 1 to 1 1/4 inches long when full-grown. These sawflies produce two generations each year; sawfly larvae can be found feeding in late June and in late August to early September. They feed gregariously on new and old needles, as well as the tender bark of young twigs. They generally feed downward from the top. Mature larvae drop to the soil and pupate; they pass the winter in this stage. 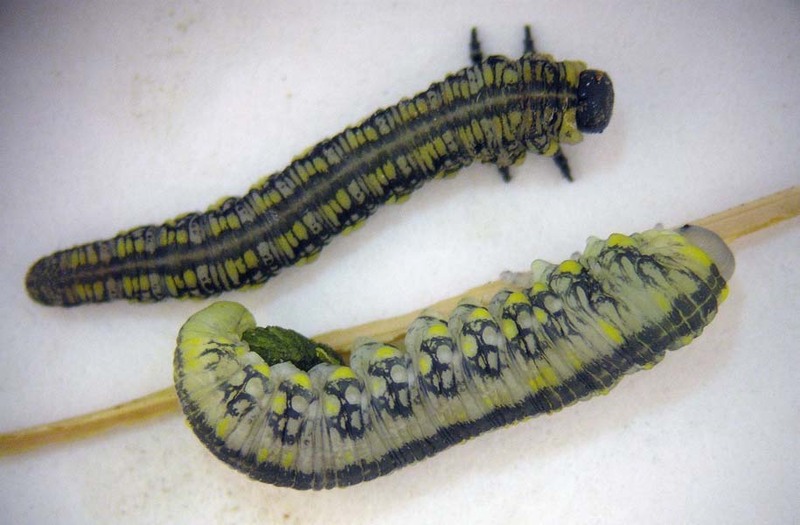 The introduced pine sawfly has a black head and black body that is covered with yellow and white spots (Figure 2). The larvae prefer to feed on needles of eastern white pine but also will eat Scotch, red, Austrian, jack, and Swiss mountain pine needles. Shortleaf and Virginia pines have been attacked but usually are not heavily damaged. Defoliation is most severe in the crown to upper half of the tree, but heavily infested trees can be completely defoliated. If this occurs after the winter buds have formed, many branches or even the entire tree can be killed. This sawfly also produces two generations each year. Larvae of the first generation feed on needles from the previous year. Young sawflies eat the more tender outer parts of the needles while older larvae consume them entirely. They are full-grown (about 1 inch long) in July. The second generation of this sawfly feeds on both old and new needles during August and September.